One of the treasures of this Atlantic beach town is its distinctive, delightful and tempting food. Seafood as a top local specialty is locally caught and usually cooked on the same day. International delights are also offered by the bustling coastal restaurants. The after dark life as well of this coastal town is as lively as the fishes in the Atlantic, with most of its live entertainment happen on the prestigious oceanfront zone. Celebrate Virginia Beach with resort dining and entertainment and turn your Atlantic nights into great nights. Uncover another treasure in Virginia Beach, the coastal shopping places that offer exceptional mix of everything you want from upscale malls, smart boutiques, antique shops, to a number of specialty stores. The tidewater town will make sure you have the extraordinary vacation experience. 'Too many sites, too little time,' has become a cliche for Virginia Beach, VA. It is whether one walks, runs, flies, or swims, still one cannot get enough of Virginia Beach,VA. There are just too many things going on in Virginia Beach. Play golf or go surfing,bicycling,fishing. Take a tour, go parasailing and fly. However, there is still more to Virginia Beach pulling you to stay or come back. When Fred Couples and Gene Bates undertook the design of Heron Ridge Golf Club, they had no idea that their project was going to entertain so many. Heron Ridge Golf Club has developed into one of the finest, best kept & friendliest golf facilities in all of Hampton Roads and we invite you out to find out for yourself! Heron Ridge, which features 14 holes with lakes, water hazards or natural wetlands winds around a unique setting of tall Oak, Beech & Elm Trees, Wetlands, Natural Depressions and uncommon Elevation changes, topography that is not typically found in this geographical area. All of these elements lead to a unique feel on each and every hole and provides a more memorable experience for those that take on the challenge. Heron Ridge offers 5 sets of tees with yardage ranging from 5000 yards all the way up to 7000 yards for the "Big Hitters" we are confident there is an appropriate tee to match your skill level. The Signature at West Neck, the latest masterpiece by Arnold Palmer Course Design, is destined to become a timeless classic. This beautiful and challenging 7010 yard, par 72 Championship course featrues expertly maintained Tifsport Bermuda tees and fairways and smooth A-4 bent grass greens. Thirteen lakes and serveral picturesque natural wetlands accent the wooded and dramatically landscaped terrain. The stone walled bulkheads fronting the 11th and 18th greens are turly spectacular while beach bunkers offer a unique visual appeal and golfing Challenge. Five sets of tees make the course fun for golfers of all skill levels. The Signature combines the talents of Arnold Palmer's golf course design team and award winning developer Baymark Construction. Together they have created a golf masterpiece that is unmatched in the Tidewater Area. 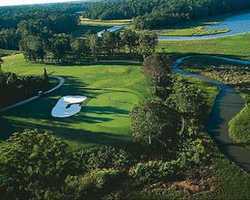 Virginia Beach National opened as the premier public golf course in the Tidewater Area. A Pete Dye Design with assistance from Hall of Famer Curtis Strange, VB National is a masterful blend of natural grasses, waste areas, rolling fairways and "tour quality" greens. The course has hosted some of the best players in the world over in past years as the host of the Nationwide Tour's Virginia Beach Open. This Par 72 course stretches to well over 7200 yards from the Championship Tees and can offer you all the challenge you want, however, five sets of tees insure you the ability to find your "comfort zone." Please join us for a round at Virginia Beach National soon. Test your game on a course that has "tested" the pros! Welcome to Riverfront Golf Club a truly breathtaking experience, Riverfront was designed by renowned golf course architect, Tom Doak. It is situated on the banks of the Nansemond River, near the mouth of the James River. The spectacular layout takes full advantage of it's dramatic and unique riverside location. 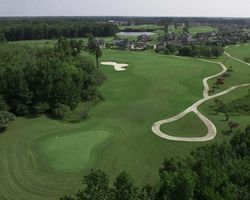 Riverfront is an old-style course that winds its way through riverfront acreage, tidal marshes, huge oaks and pines and vast rolling farmland. It offers a truly amazing setting for a great round of golf. Riverfront was voted 4-1/2 stars by Golf Digest and included in "40 best Daily fee courses" by 'Golf and Travel Magazine'. 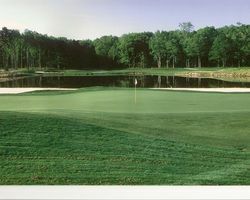 This course is a "must play" in the Hampton Roads area for golfers of all abilities.